A camera backpack isn’t only useful for photography. The Vivitar Camera Backpack Bag is a useful thing to have if you want to store or transport any tech equipment or gadgets such as camera equipment, consoles, PCs and more. You can even use it as a normal school bag if you want. This is a versatile product that can be anything you want it to be—whether it is photography related or not. The Vivitar Camera Backpack Bag is not just your everyday average camera backpack bag. It could very easily be your everyday bag for all occasions. It is lightweight, has a durable construction and has versatile storage compartments that let you fit all of your photography items such as cameras and accessories along with other personal items such as laptops, tablets, phone, notebook, keys, wallet and so on. You can even use it as a normal school bag or even a camping bag where you can easily organize all of your supplies into one pack so you won’t have to worry about the arrangement of your things since they are already conveniently divided and arranged accordingly. You can even fit game consoles and controls within this bag. This is ideal since it keeps the console and the controls well-cushioned so that you can easily and safely transport them. If you do use it as a camera bag, you will find that you are able to comfortably fit a DSLR camera with an attached standard zoom lens as well as other accessories such as flashes, pods and extra lenses. This could be your go-to photography bag if you need something that can fit everything that you could possibly for a day’s shoot. You’ll be ready for any adversity and be able to adjust to any setting or situation that might call for a different type of lens or different types of gear. You can feel confident and secure that you have brought everything that you could possibly need in order to cope with any situation that might arise on the day of an important shoot with this bag in tow. If you open the bag, you will see thickly padded dividers that you can easily customize depending on what you plan to bring for a day’s shoot. The thick padding ensures that your gear is well protected and items won’t bump into each other as you move around. The adjustability ensures that you can fit different equipment in easily. This snug fit ensures that your gear does not move around at all while you carry it, even as you walk or move around while working. 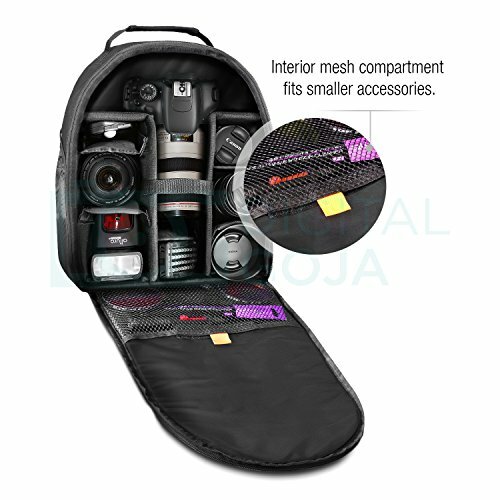 There are also mesh compartments that you can use to fit your smaller supplies such as flash drives, memory cards, lens covers and other smaller things that you usually have with you on a shoot. On the outside there are two extra side compartments in case you have extra things to carry along. You can store non-fragile items or personal items such as a water bottle, face towels and foldable umbrellas so that you do not have to keep them in the main compartment, which can eat up space or potentially damage your gear for example when carrying water bottles that may spill. It also has a separate tripod or monopod holder since these are a staple accessory to have when shooting. 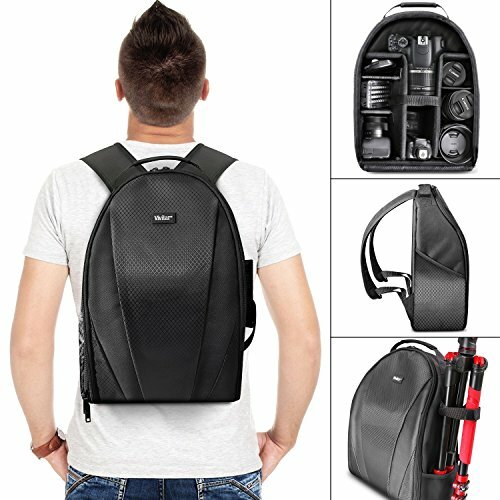 To ensure your satisfaction and to better serve you as a customer, the Vivitar Camera Backpack Bag comes with a Digital Goja 90-day 100% satisfaction guarantee. Although this bag is made up of tough material, its stitching is not reinforced, making its seams a vulnerable weak point that could possibly endanger your gear if it does rip apart. You might have to reinforce the seams yourself if you buy the product, or risk the bag ripping and your gear falling out as you are carrying them. Also, there have been a few comments about how loose the tripod holder is. It tends to move around too much, causing the tripod to hit the carrier, which could be uncomfortable. Being lightweight, adjustable and versatile, this is a great bag to have for casual or recreational photography. If you are still starting out and just want somewhere to stow away your gear, you might want to consider the Vivitar Camera Backpack Bag since it can be used for other things besides photography such as for storing personal items and other gadgets such as consoles. If you have some tech equipment that you need to store or transport, then you might want to have a look at this.